If you are only able to make the minimum monthly credit card payments and you balances are not going down, our Debt Consolidation Program may be right for you. PAY LESS: Better repayment terms are offered by most creditors. Most will lower interest rates, wave late and over the limit fees AND bring your accounts back to current without making up those missed payments. This can save you thousands over the life of the debt! PAY OFF YOUR DEBT FASTER: You’ll be able to pay off your debt in three to five years rather than the average 25 years it could take without our program. REDUCE YOUR STRESS: Our customer’s are relieved when the collection calls disappear. ONE EASY LOW MONTLY PAYMENT: Your credit cards and other unsecured debts are consolidated into one monthly payment so you don’t have to juggle payments. 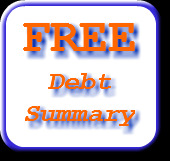 Find out how our Debt Consolidation Program can help you!